On August 26, 2017, Hurricane Harvey made landfall in the continental United States. It was the first hurricane to hit Texas since 2008, and once it hit, it lingered. By the time the storm moved on from Texas, many regions throughout the state had seen more than three feet of water. Streets and homes were flooded, power was out, and communities were faced with the task of rebuilding. During the storm as rain poured down, the Houston Food Bank's facilities and safety team leader Anthony Medina was stuck on site. His home, he knew, was flooding. There was nothing he could do for his house, but there was something productive he could do where he was. He started packing trucks—stocking them with food that would eventually be dispatched throughout the region to individuals in need. "He did that knowing that his house was underwater," says Trina C. Taylor, senior manager of the Client Assistance Program at the Houston Food Bank. "With this agency, they really take care of their employees, and we, in turn, take care of each other. For Anthony to start packing trucks, it's just what happens. It's unbelievable, but I'm just not surprised." Social service agencies throughout Texas, Florida after Hurricane Irma, and Puerto Rico after Hurricane Maria were and continue to be tasked with the responsibility of providing services to their communities, even as they—the organization and the individual staff members—cope with having experienced the same natural disaster as their clients. Not all natural disasters allow for preparation. Tornadoes and earthquakes, for example, come with little warning. The system in use in Mexico City, Mexico, gave citizens mere (though vital) seconds before the quake in September began. Hurricanes, however, usually take days to arrive. "With a hurricane, you have a long time to prepare," says Debra Albo-Steiger, LCSW, program manager and district homeless liaison for the Project UP-START Homeless Education Program at the division of student services in Miami-Dade County Public Schools. "You don't have that in an earthquake. If [Hurricane] Irma came within a 12-hour period, that would be a much different story." Having, at the very least, an idea of what's to come allows organizations time to form contingency plans. On the simplest level, they are able to secure facilities and set up means of communicating with staff and the community. "Memorial Assistance Ministries (MAM) implemented its disaster communications system. We made sure that the website and Facebook messaging, as well as telephone answering systems were able to share news about MAM services," says Patricia Vazquez, MDiv, Rapid Rehousing case manager in the Houston area. Employees at MAM were sent home early the Friday before the storm and a staff communications system was activated. 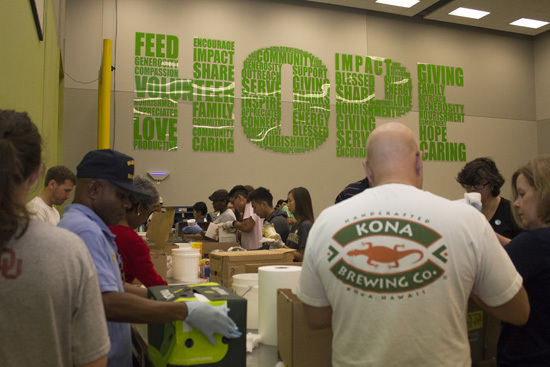 The Houston Food Bank looked to the agencies where food is delivered and dispersed, planning in the hours before Harvey for the services that would need to be delivered as soon as possible after it. "We have an agreement with the city and the counties to stock shelves in advance," Taylor says. "We also had several agencies that agreed that 72 hours after landfall, they would be up and running, ready to provide food to the community. We prepared those orders in advance." Volunteers working to sort food and pack disaster boxes at the Houston Food Bank for Harvey relief. For programs like Project UP-START and organizations such as Tampa General Hospital, the lead-up to Hurricane Irma involved client safety as well. Project UP-START provides services to students experiencing homelessness, working to ensure, among other things, that the student is able to continue his or her education regardless of where he or she is living. That means that many of Albo-Steiger's clients were in immediate need of secure and stable shelter. "The shelters for hurricanes in Florida are typically our schools," Albo-Steiger says. "While they're run by the county and the Red Cross, the school building is open. We started disseminating the information about where to go. I reached out to our contacts; we worked together to get the word out. "Before the storm came, we had homeless families on the streets. With Irma coming, we had to make sure the families were safe." In a hospital, it's not about getting patients into a shelter but rather keeping those who could not leave in place, with all they need—equipment, medication, staff, and electricity—to keep them well. "In terms of the social work department preparing for the storm," says Kimberly Browne, LCSW, ACM-SW, assistant director of social work at Tampa General Hospital, "there was a big push to try to get as many patients out of any immediate predicted path of the storm. Anybody who was medically stable, we made every effort to get them linked up with family. But we are not a facility that evacuates; we shelter in place. So the patient is able to stay in the hospital." Logistics are just one part of preparation, however. There is also an emotional buildup for clients and providers alike. One cannot deny that preparing for a hurricane means preparing for disaster. "You don't know what is going to come of the storm. Our team didn't know what their roles were going to be physically during the storm," Browne says. "If there was a full loss of power and patients needed hands-on care, we would have been tasked with more of that. "It was important for me," she continues, "to be mindful of the fact that while I was able to stay pretty calm, not everyone on my team and moreover not everyone in the hospital could say that. Acknowledging the reality of their fears and helping them stay grounded was important. We spent a lot of time validating the emotional state that people were in." Even with contingency and safety plans, returning to work and providing services in the wake of events such as Harvey, Irma, and Maria is no simple task. Again, the logistics can be difficult. First, how do you get the services to the clients? The Houston Food Bank was determined to get food out within 72 hours, and they returned to work the Wednesday after Harvey ready to coordinate delivery. "Once [the agencies] got ready, we started getting all of the food to them as soon as we could. But the water stayed around for so long," Taylor says. "We took whatever route we could." There can also be contingencies involving volunteers. "Because people tend to converge on the scene of the disaster in order to help, from a response professional's perspective, those volunteers may complicate the response. They may not have the skill sets that are needed," explains Monica Schoch-Spana, PhD, senior associate at the Johns Hopkins Center for Health Security, visiting faculty at the Johns Hopkins Bloomberg School of Public Health. 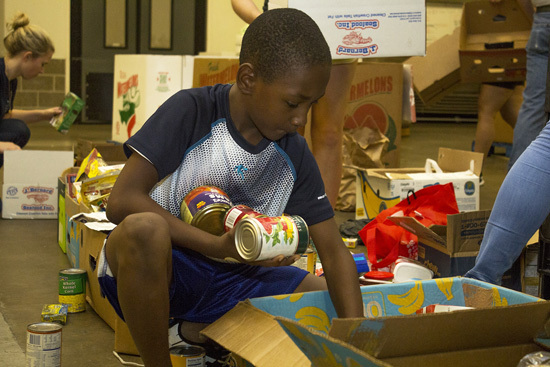 For example, from August 30 to September 8, the Houston Food Bank had 8,699 volunteers who contributed 28,949 hours of assistance. Those types of numbers can be overwhelming if an organization is unprepared. "What you want to do," Schoch-Spana says, "as a response professional, is balance the needs of the community with the desires of the volunteers to help out." She notes that many communities will organize themselves around existing leadership structures such as congregations or social clubs. Social service providers who coordinate with community groups and build off established relationships will be and are more productive in the volunteer boom after an emergency. And finally, the new needs of both the clients and staff have to be taken into account so the services provided are as beneficial as possible. In many ways, the needs for both groupings are similar. All have been through a natural disaster, and while everyone interviewed for this articlewas quick to say how lucky they were, the effects—e.g., flooding, displacement, lack of power, guilt, relief, sorrow, and/or trauma—were felt by all. "This is the first time we [the staff] were experiencing living in transition," Albo-Steiger says. "A lot of us were living in that situation for over a week. We couldn't stay in my house. We were couch surfing. I had one staff member who lived in her car; another moved into a motel. The first day back, it was difficult, because so many of us had not been in our beds the night before." Additionally, she adds, the trauma of the event was inescapable. "When you're dealing with a natural disaster, it is everywhere." Some of what can be done with this in mind is, as an organization, to offer flexibility and increased support. "MAM provided healthy food at lunchtime during the early days of recovery, brought in a massage therapist for chair massages at the end of week two, and checked with all staff personally to understand their personal needs poststorm," Vazquez says. Taylor notes that the Houston Food Bank offered childcare and pet care to staff and linked them with resources in the community that the food bank could not provide. On an individual professional level, providers must be aware of the need for teamwork, compassion, and, above all, self care. The instinct of social workers is to help first—to have solutions to problems available as quickly as possible. "I want to make certain that we have an answer to every question or every need," Taylor says. "But there are so many barriers." Thus, if the provider doesn't also allow him- or herself to be a person, exhaustion and burnout can take hold. "The first thing that I've done," Taylor says, "is I take my moments. I walk away, take a moment, and breathe." It can be as simple as that and, in the wake of a natural disaster, often needs to be. Hurricanes and other major weather events will continue to occur, and as a result, social workers will be on call. They may not be the first responders, but they are often the second, prepared to help their clients and each other assess, recover, recoup, and breathe. — Sue Coyle, MSW, is an award-winning freelance writer, a social worker in the Philadelphia suburbs, and a frequent contributor to Social Work Today.